Which forms of visual test are available in Litmus? Why is it important to test my newsletter? Example: Newsletter and content blocking. We have made a cooperation agreement with the American company Litmus. This cooperation means that we are now able to offer you the possibility of making visual tests, of your newsletter, before you send it. 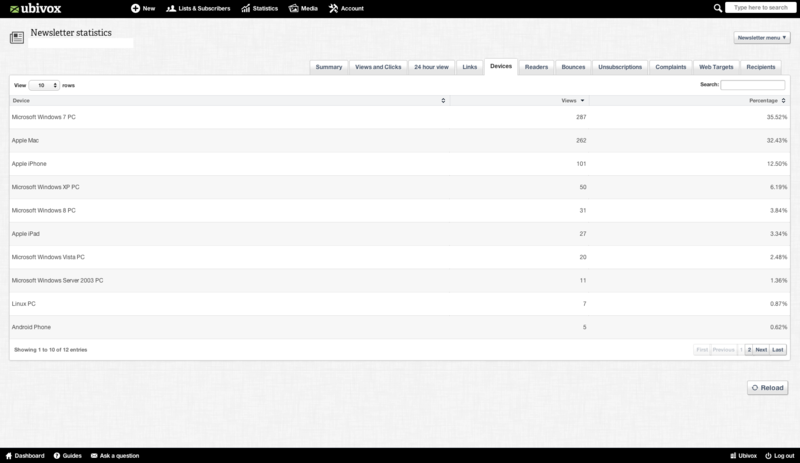 You can test how it appears in your receivers inbox as well as how it appears when it is open. 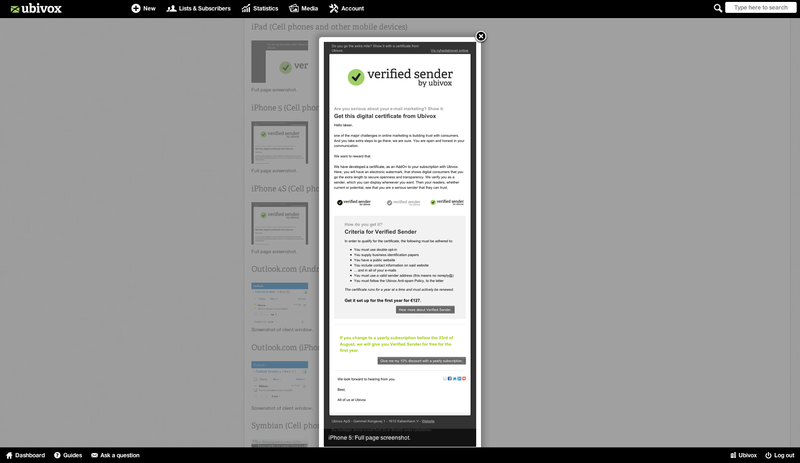 You can also test whether e-mail clients interpret your newsletter as spam before it is send. The Litmus Add On enables you to deliver better newsletters to your receivers, since you now have the possibility of making visual tests, in the system, before sending it. 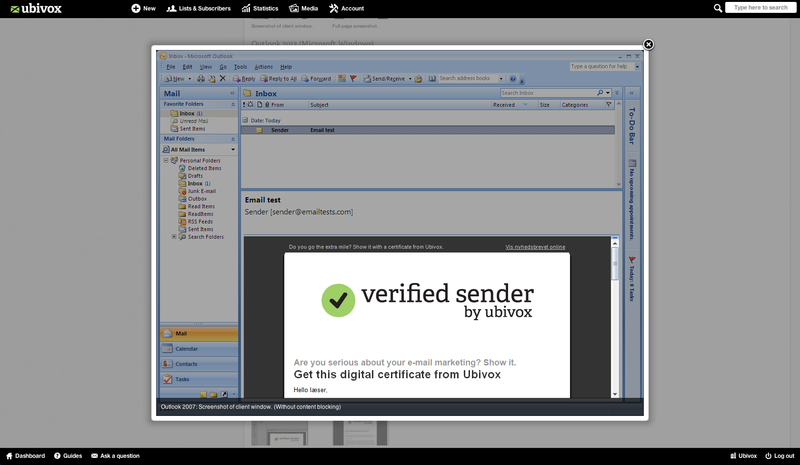 Litmus will also increase you delivery rate as you can spam test newsletters before they are send. You can use this information to modify newsletters if need be and, hence, create a better end product for receivers. When your newsletter has been send, your receivers use different devices to access it. The fact that receivers use different devices makes it favorable to test whether the newsletter appears, as you want it to in the inbox and when it has been opened on the different devices your receivers use. We will now introduce a few examples to underline how visual tests can benefit you and your receivers. Depending on which e-mail client your receivers are using, it may contain the preview function. If receivers have this function in their e-mail client, and if you are using a large header and preheader in your newsletter design, it can influence you layout. It can do this since content may not be visible in the preview because large headers and preheaders dominates the preview. The picture above has been taken from a Litmus test where you can see how the preview function is in Outlook. We can see how the designed picture in the header pushes the content down and distorts the content and thereby merely present receivers with a header. It is therefore a good idea not to make too big headers and preheaders inside the newsletter. Content blocking can have a significant impact on the visual appearance when receivers open your newsletter. If you use a lot of images in your newsletter, i.e. header, preheader, offers etc. it is a good idea to test how the layout is influenced if content blocking is enabled. The image below is an example of how a newsletter can appear in Gmail when content blocking is enabled. If you create newsletter that only contains images with text on them, your newsletter will appear as empty when receivers with content blocking opens them. We strongly advice users not take this approach. A predesigned full image may look good, but it can also be counterproductive. 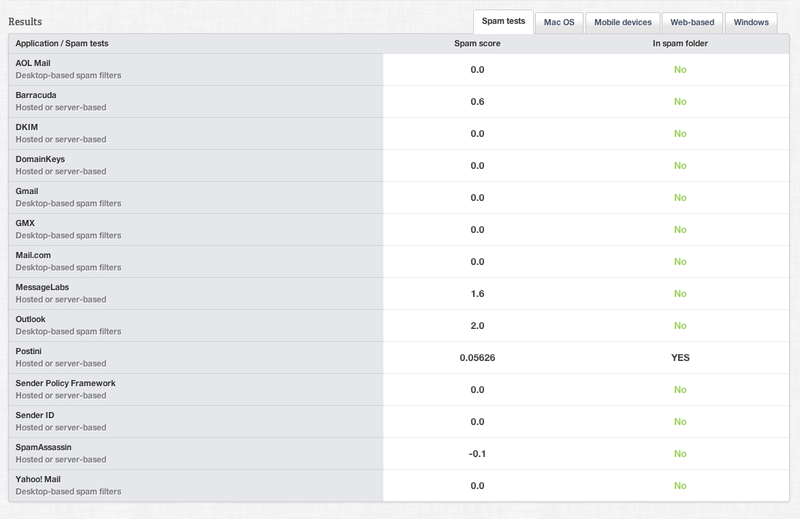 Through the Statistics feature you can see which devices your receivers use to open your newsletter. If you therefore know that most of your receivers uses iPhones to view your newsletter, you can test how it appears on this device. 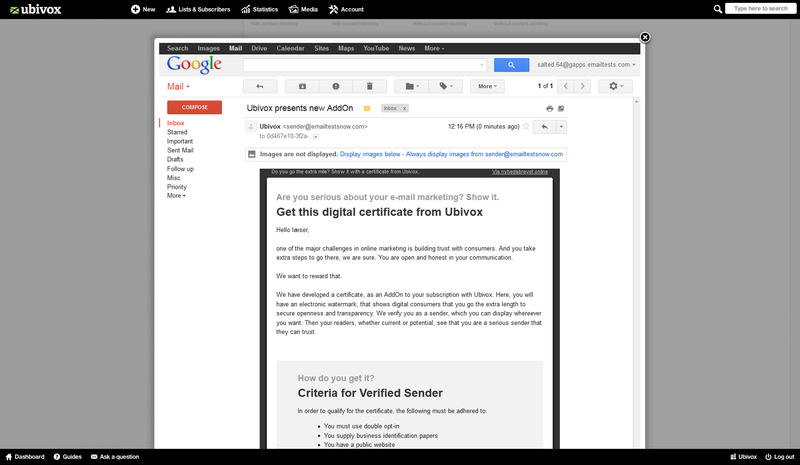 Through Litmus you can also test how your newsletter appears in your receivers inbox. You can, for example, use this option to modify your newsletter's header and preheader. 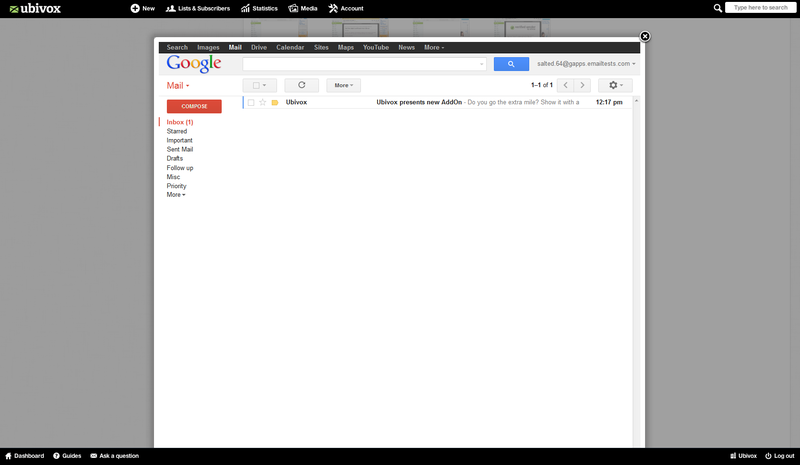 Below you can see how it can appear in Gmail and Outlook. As your header and preheader are incentives that get your receivers to open your newsletter, using Litmus is an advantage. It is an advantage because you can see the layout exactly the same way as receivers will see it. By using this information you can, for example, make sure that a header and preheader fits to the inbox on an iPhone. By considering your receivers preferences you become better at targeting. 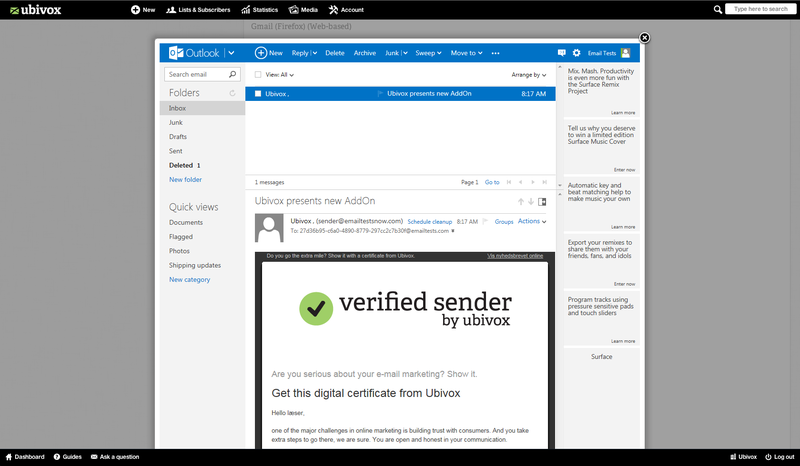 If your receivers have the preview function, as in in the Outlook image above, you can design your newsletter so that it is a further development of the header and preheader that is visible in the inbox. We recommend not making headers and preheaders to big inside the newsletter. We recommend not doing this, since it has a large impact on how receivers see the newsletter. Images, logos etc. are nice to look at but if it disturbs the message they should be avoided or at least made smaller. They can disturb the message when the preview function is available as in the Outlook image above. By using the statistic in Ubivox you can increase your opening rate. You can do this by checking the statistics from earlier newsletters. Herein you can, among other data, see which devices receivers use to open your newsletter. You can find your newsletter statistic by clicking at a sent newsletter on your Dashboard. Click at Statistic. You can now see which devices receivers use by clicking at Devices. In this example we can see that ordinary PC, Mac and iPhone is what is being used most frequently to open the newsletter. In this instance it is therefore beneficial to test how future newsletters appear on e-mail clients on iPhones, PC and Mac. By testing whether your newsletter appears as it is supposed to in the different e-mail clients, you ensure that your newsletter is consistent across the different e-mail clients used by your receivers. You thereby ensure a consistent layout across different devices and will therefore most likely increase your opening rate. If you focus on your header and preheader and how the message herein overlap each other, it is also beneficial to test how the newsletter appears in the inbox. As a starting point, all of our templates fit with all e-mail clients. But if you decide to create HTML newsletters, insert images with text on it etc. it can affect the layout (Specifically if receivers have content blocking enabled). It is therefore a good idea to test the visual appearance of the newsletter before you send it. Through Litmus you can now also spam test your newsletter before your send it. Below you can see the results of a spam test. If your newsletter is interpreted as spam, we can, unfortunately, not provide the information as to what exactly made it so. We cannot do this, since e-mail clients do not provide this information. If they did, it would be way to easy for spam and junk e-mail to penetrate our inboxes. Despite this, you can use the spam test information to make alterations to your newsletter, if it is interpreted as spam. If it is, it is usually a good idea to look at the header and preheader. If they contain words and phrases like: "free", "just for you" it is most likely what caused it to be marked as spam. After you have made your alterations you can test it again and see if it helped. Use Litmus to test again and again. There are no limitations as to how many test you can make. Use them to improve your newsletter for your receivers. Take their preferences and device-opening pattern into consideration when you test and see if it fit together. Take this information into your consideration the next time you are about to send your newsletter.